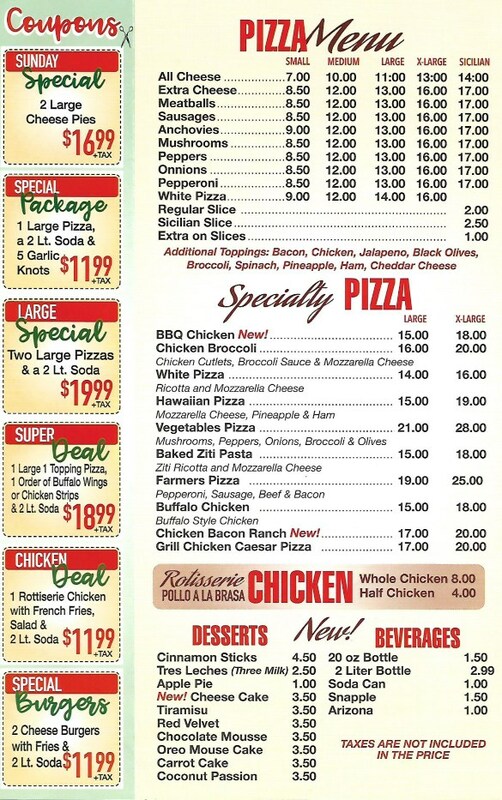 Farmers Pizza Menu, offers great traditional pizza, burgers, pasta, fries, wings, salads and so much more. 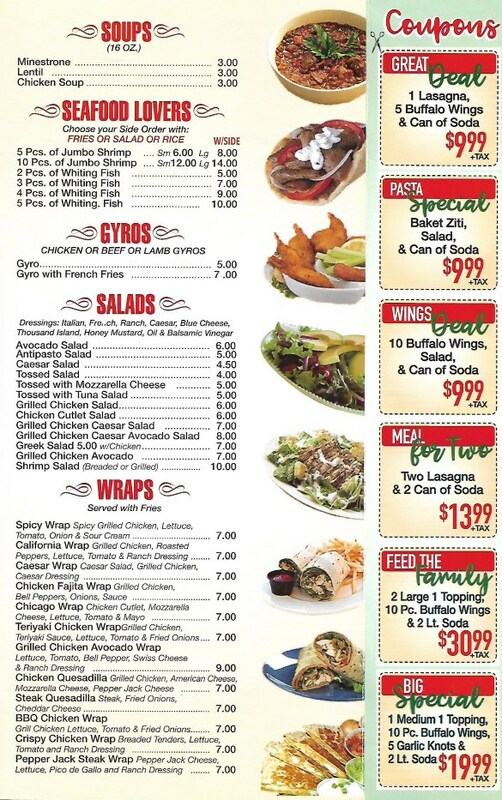 The pizza is delicious and we have other great foods like Italian food, burgers, wraps, and salads. Our Pizzeria also offers specialty pizza like BBQ Chicken, Chicken & Broccoli, White Pizza, Hawaiian Pizza, Buffalo Chicken Pizza, the meaty Farmer's Pizza and other selections. Furthermore they have scrupulous pasta dishes like Pastas with Marinara Sauce, Garlic and Oil, Clam sauce, Alfredo Sauce, Vodka Sauce, and with Meat Sauce or Meat Sauce with Cheese. Also they offer great burger meals with staple burger meals like Burgers with Fries, Cheese Burgers, and a really good turkey cheese burger. They also offer "Deluxe" options with fries. The also have healthy food choices. The restaurant is that it has healthy food choices too like grilled chicken and avocado salad, turkey burgers, and grilled chicken wraps. Farmer's Pizzeria has great Italian food but also is one of the few places in the community where you can get good healthy food choices as well.